We’d love your help. Let us know what’s wrong with this preview of Stoneskin's Revenge by Tom Deitz. 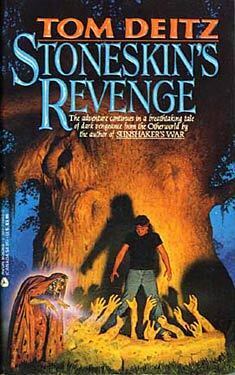 To ask other readers questions about Stoneskin's Revenge, please sign up. This book picks up where the fourth book left off, but it focuses on Calvin. So this book focuses more on his story and his mythology. Thomas Franklin Deitz (January 17, 1952- April 27, 2009) was an American novelist from Georgia. He had a B.A. and M.A. in medieval English from University of Georgia. He was the author of the "Soulsmith Trilogy," comprised of the books Soulsmith , Dreambuilder , and Wordwright . He also wrote a popular series consisting of Windmaster's Bane , Fireshaper's Doom , Darkthunder's Way , S Thomas Franklin Deitz (January 17, 1952- April 27, 2009) was an American novelist from Georgia. He had a B.A. and M.A. in medieval English from University of Georgia. He was the author of the "Soulsmith Trilogy," comprised of the books Soulsmith , Dreambuilder , and Wordwright . He also wrote a popular series consisting of Windmaster's Bane , Fireshaper's Doom , Darkthunder's Way , Sunshaker's War , Stoneskin's Revenge , Ghostcountry's Wrath , Dreamseeker's Road , Landslayer's Law , and Warstalker's Track . His stand-alone novel The Gryphon King centers around a few of the characters from the later novels in the last series mentioned. Deitz also won the Phoenix Award in 2007. This award is given at the annual DeepSouthCon to a professional who has done a great deal for Southern Fandom. Deitz was a well-liked college instructor as well, with stints as an adjunct English faculty member at Gainesville State College, Lanier Tech, and Tri-County Community College, and received a tenure-track appointment as assistant professor in Fall 2008 at Gainesville State College. He was recognized as GSC's adjunct faculty member of the year in 2008. In addition to writing, Deitz's creative outlets included visual art (murals, fantasy art, and more); drama (with minor roles in a number of community and college productions); model automobile collecting; costumery; and other pursuits via the Society for Creative Anachronism. He was a founding member of the SCA's Barony of Bryn Madoc. Deitz died on Monday, April 27 2009 of heart failure. He had a heart attack in January of this year and was a candidate to receive a Ventricular assist device (VAD) but had suffered too much damage to his heart for the device to be implanted.